Following are a few tips for fusers; also known as the Rules of Etiquette from the Chicago School of Fusing. Some brands of fusible are difficult to stitch through or change the surface of your fabric. Suggested fusible webs are: Wonder Under paper backed (#805), Soft Fuse or Misty Fuse (for lightweight fabrics like silk). Transfer the glue with a hot (cotton setting), dry iron for 5-7 seconds in each spot. Place the fabric down with rough side or glue side of the paper on top. Glide the iron across the paper. Make sure the iron touches every inch of the paper including the edges and corners. Go to the edge and beyond! Fabrics with no finish like 100% cotton hand-dyed and batik fabrics are best for raw edge fusing because the color goes through the fabric. Fused elements from printed fabrics with a white back will show a white edge. Some fabrics with a permanent press or other finishes will not adhere well with fusible web. Fabrics with higher thread count fray less when cut. Wash your fabric to remove any starch or sizing before fusing. Do not use fabric softener. Fabric that bubbles or ripples when fused will flatten out when the paper is peeled off. If the web separates from the paper, place the web on the fabric with release paper on top and fuse. Always let the fabric and web cool before removing the paper. Paper without glue is called silicone release paper. Save the release paper. This paper with a silicone coating and can be fused to over and over again. Parchment paper is similar to release paper and can be used in place of release paper. Test the paper first to make sure it has enough silicone on it. Note: on some versions of fusible web only the “shiny” side of the paper is usable as release paper. Remove the release paper in one piece by first fanning with a finger then swiping your hand between the fabric and paper. Feel for gummy areas where the iron didn’t cover and re-fuse. Both parchment paper and release paper can be used for assembling quilt tops, fused collages, storing fused scraps, protecting the ironing board, and pattern making. Peel the paper off the fused fabric before cutting. Paper dulls scissors and cutting blades. Also fabric edges may fray if paper is peeled off a cut shape. Always use sharp scissors and rotary cutter blades. Dull tools fray the fabric. If you must leave the paper on when cutting out a pattern piece, remove it by gently slicing the paper in the center of the fabric with the tip of your scissors and peeling from the center. When cutting a stack of fused fabric, do not place fused sides together or they may be difficult to separate. Up to 3 layers of fused fabric shapes can be cut out at one time. Cut fused fabrics web-side up when using rotary cutter so the glue side does not stick to the mat and fray fabric upon removal. Also, it is easier to see areas where there is no glue. Whenever possible, overlap dark colored fabrics on top of light value fabrics when joining the fabrics. Dark fabrics may cast a shadow if placed under light value fabrics. Fuse-tack elements for only 3 seconds and with little pressure. Too much heat applied repeatedly will weaken the glue, burn it into the fabric, change the fabric color, make the fabric stiff, and elements will no long adhere to other fabrics. Elements that are fuse-tacked can be easily removed, although, there may be some fibers and glue left on the surface. Test your batting before fusing your quilt on top. Some batts have a scrim side that may cause the quilt to ripple. Do not fuse to the scrim. Hobb’s Premium 80/20 Heirloom cotton or wool batting works best. 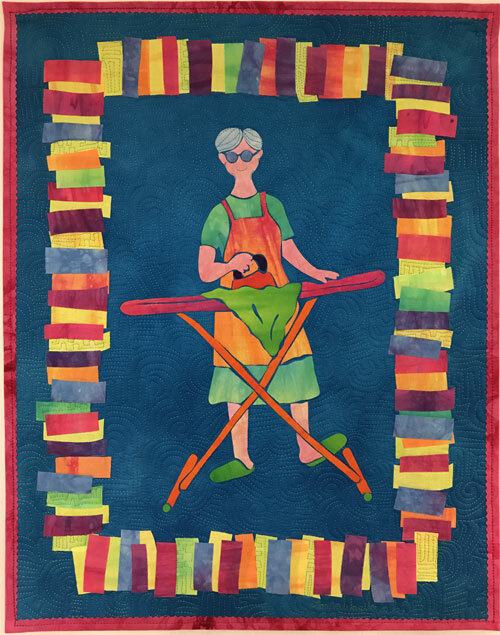 Once complete, remove your quilt top from the release paper, add water to your iron, and steam set the quilt top to the batting by gliding the iron across the quilt for 10 seconds in each spot. Use a dry press cloth to protect the quilt top. Steaming makes the quilt easier to hand stitch (just through the top and batting) or machine stitch. Use a titanium or chrome coated machine embroidery needle for machine quilting. This type of needle is less likely to gum up when stitching. Save all your fused scraps. They are great for tiny elements and collage work. And most importantly, keep the iron and ironing surface free of fusible web. If the web touches a hot iron, the glue may transfer to the surface of your quilt. Keep irons clean.